What are Zoodles? I’d tell you, but it would be better if you just tried them! Hey, didn’t We Eat For Real already feature Corn and Tomato Pizza and Easy Caprese Salad with Grilled Chicken? Yep. This blog showcases what happens in my kitchen each week. That being said, a new recipe for me this week was Italian Zoodle Pie. The zoodle (i.e., zucchini noodle) is a game changer for folks looking to reduce or avoid carbs. Zucchini as a pasta replacement really works. Does it taste exactly like a noodle? Nope. But, you won’t miss the pasta – promise. To make this recipe faster, you’ve gotta get a spiralizer or zoodler. There’s really no other sane way to create the zoodles. I can’t imagine trying to cut zoodles by hand with a knife! 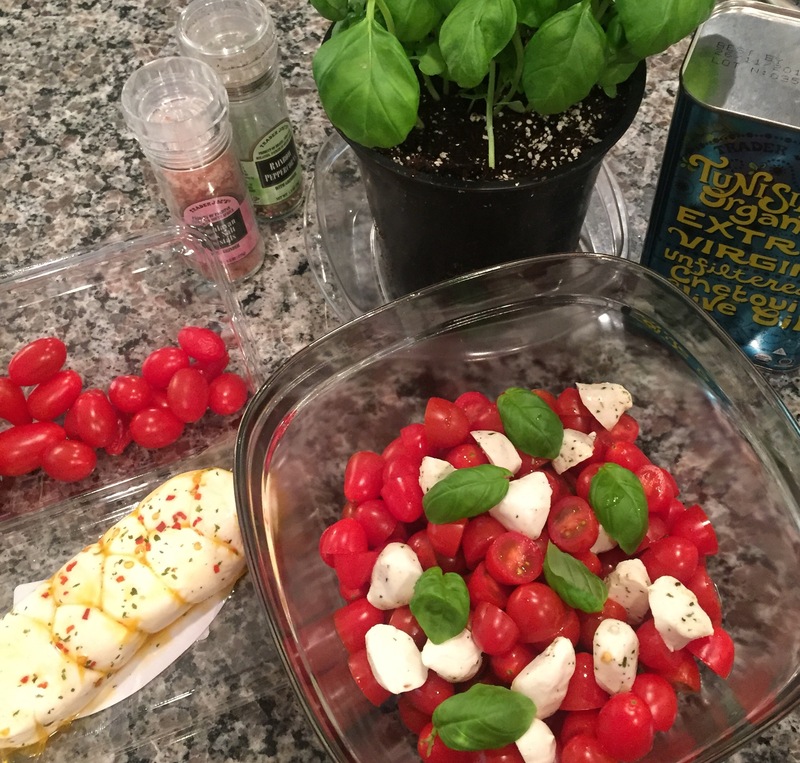 The Easy Caprese Salad is an all time family favorite. At it’s most basic state, it’s a four ingredient meal! You can take it a step further and add additional flavor depth with a drizzling of the balsamic reduction. However, if don’t have the time, don’t make the reduction. It will still be fan-freaking-tastic! The other new recipe this week was Almond Oat Cookies. The original recipe called for almond flour. Well, I didn’t have it. So I used almond meal. What’s the difference between almond flour and almond meal? Read more here. I added some vanilla too because all cookies taste better with it (if you ask me). Directions: Preheat oven to 350 degrees. Line a baking sheet with parchment paper or a silicone liner (alternative: baking stone). In a large bowl, add all ingredients and mix until thoroughly combined. Form into balls using a large scooper (or ice cream scoop). Bake for 12-15 minutes or until slightly golden. Tip: If using almond flour instead of almond meal, cookies may require less baking time (reduce by 5 minutes). Directions: Preheat the oven to 375 degrees. Prepare the zucchini using a zoodler or Spiralizer. In a large bowl, whisk the eggs and ¼ c. Parmesan cheese. Add the zoodles to the egg mixture and toss to evenly coat. In a deep dish pie pan, add the zoodles. In the previously used mixing bowl, mix together the ricotta, remaining ¼ c. Parmesan cheese, ½ teaspoon of dried herbs, and fresh basil. Evenly spread the ricotta mixture on top of the zoodles. In that same mixing bowl, combine the marinara, diced tomatoes, and the remaining ½ teaspoon of dried herbs. Pour an even layer of the tomato mixture on top. Top with the shredded mozzarella. Bake for 30 minutes. Allow to rest 5 minutes before slicing. Directions: Add ingredients to a lid with a jar. Shake and pour over organic greens salad. Directions: Preheat the oven to required pizza dough temperature. In a medium/large skillet warmed to medium heat, add the olive oil and onion and jalapeno (if using). Sauté until onions are translucent (about 5-7 minutes). Add the corn and sauté another 5 minutes. The next step happens quickly because you do not want to burn the garlic! Add the garlic, stirring constantly, allow it to cook until for about a minute or until you can really smell it. Immediately squeeze the lemon over the skillet and add the cilantro. Stir in the cherry tomatoes and allow the heat to release their juices (about 5 minutes). Remove from the heat. With the dough on the pizza stone or baking sheet, add a thin layer of mozzarella cheese, followed by the corn mixture. Crumble the goat cheese atop the pizza and add the remaining mozzarella cheese. Bake according to your pizza crust directions. 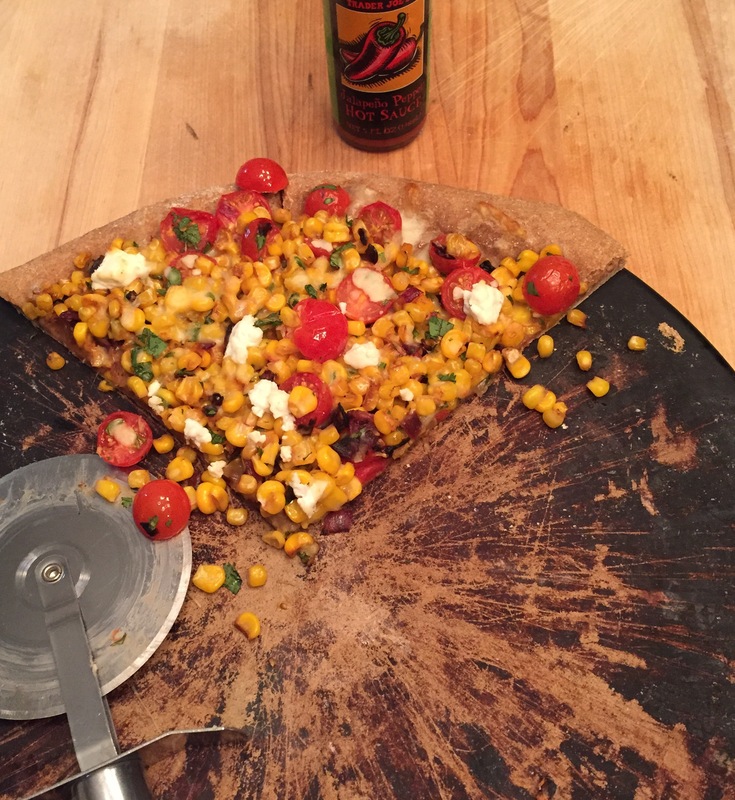 This is amazing – especially with a few drops of hot sauce on each slice!!! Directions: In a medium bowl, gently toss the tomatoes, mozzarella, olive oil, and basil. Season with salt and pepper to taste. Finish with a drizzling of balsamic glaze (optional). Serve immediately. I usually serve this with grilled or pan seared organic chicken breasts. Directions: In a small sauce pan, add the balsamic vinegar and stevia. Bring to a boil and immediately reduce to a simmer. Allow to simmer until it has reduced by one-half (about 20-30 minutes), stirring occasionally. It’s done when it is thick enough to coat a wooden spoon. Directions: In a small bowl, whisk together the dressing ingredients. Set aside. Tip: The longer it’s refrigerated, the better. Refrigerate while preparing the chicken and that will do the trick. Directions: In a small bowl, combine the oil, herbs, and salt/pepper. Brush chicken with oil mixture. Grill (or pan sear) on medium heat for 6-8 minutes per side. Remove from heat and cover with foil until ready to serve.